Dynamic individual to join the Bloodstock Department to assist with the co-ordination and organisation of sales, starting in July 2019. Successful candidate will be office-based in Newmarket and will report to the Bloodstock Director. • Good knowledge of the bloodstock and racing industries. • Able to maintain and develop strong relationships with both established and new clients. • Willingness to work during weekends and evenings when required. • Self-motivated but also a team player. • PC literate with excellent attention to detail and the ability to work under pressure and to strict deadlines. Naas Race Company PLC (t/a Naas Racecourse) is a leading horse racing venue situated on 189 acres adjacent to the vibrant & growing town of Naas, Co. Kildare. Staging a minimum of 18 race meetings per year together with a broad range of non race day activities it takes a very proactive approach to serving the racing industry. • Delivery of short term & long term strategic goals for the entire Naas Racecourse business comprising both traditional racing events & commercial non race-day activites. • Developing the Naas Racecourse brand. • Preparing, monitoring & controlling race day activities. • Oversight of all capital projects & improvement works. • Promotion of Naas Racecourse locally, nationally & internationally as required. • Fulfilment of Company Secretary function on behalf of Naas Race Company PLC. • Experience at senior management or similar level, prior racing industry experience a distinct advantage. • Strong business acumen, commercial leadership, strategic thinking, service delivery, industry knowledge, and an ability to influence at the highest level. • Professional approach and positive attitude in dealing with key stakeholders. • Relevant 3rd level degree an advantage. Will reflect the seniority of this role & the experience/skills of the successful candidate. All applications will be dealt with in strict confidence. Looking for an all-around executive assistant to grow with the international racing stable and manage its new headquarters in Lake Worth, Florida. The candidate will be responsible for answering phones, maintaining files, owner ticketing, licensing and assisting TVI staff with administrative duties as needed. Candidates should be organised, possess proficient computer skills and be be able to work without supervision, as the principals of the company spend a lot of time on the road. Interest in international racing is a must. Hands on manager with a focus on yearling prep experience. Knowledge and experience in handling mares and foals. Breeders of: (G1) Lemons Forever, (G1) Buddha, (G1) Anees, etc. Ideal candidate would have several years experience working with mares and foals. Strong organizational and horsemens skills a must. Full Time Position with room for growth, paid vacation and full benefits available to the right candidate. The Hong Kong Jockey Club (HKJC) is operating a Racecourse at Conghua in Guangdong Province, South China, which officially opened in August 2018. The Conghua Racecourse (CRC) (https://crc.hkjc.com/en/index.aspx) is a major strategic project of HKJC as a cross-border home of HKJC’s stabling, training and racing facilities to support Hong Kong racing operations. It is a 150 plus hectare horse training facility designed to accommodate more than 650 horses from Hong Kong. By transferring horses to CRC for training, it enables HKJC to upgrade training facilities to maintain world-class standard so as to meet the growing demand for horse ownership in Hong Kong. The level of appointment will be commensurate with qualification and experience. A contract employment will be offered to the successful candidate. Contract renewal will be subject to mutual agreement between the CRC and the individual. New Vocations is the largest racehorse adoption program in the country, specializing in rehabbing, retraining and rehoming retired racehorses. Equilume is the world leader in the research and development of light therapy solutions to assist the global horse industry maximize reproductive efficiency and competitive performance. We are delighted to announce that due to the increased demand for our new products, we are currently recruiting a North American Territory Sales Manager to assist us in meeting this demand. The suitable candidate will professionally represent our brand and products and be able to communicate the scientific message to potential clients. 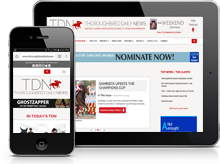 At the TDN, we’re always looking for well-written, hard-working, dedicated people who love the industry to join our growing staff. Specific opportunities, when they exist, are listed here. If you’d like to send us your resume and a cover letter, please email [email protected] and let us know why you’d be a perfect member of our team.